Julie Zickefoose on Blogspot: New York State Zick Alert! New York State Zick Alert! Delighted to tell you that I'll be speaking at the Roger Tory Peterson Institute in Jamestown, NY, on Wednesday, July 31 at 7 pm. I'll give my talk, "The Bluebird Effect: Uncommon Bonds with Common Birds." The talk is free and open to the public. I am at this moment working to include photos and video of my three current charges, Elsa, Ida and Toddy, the orphaned bluebird sisters. 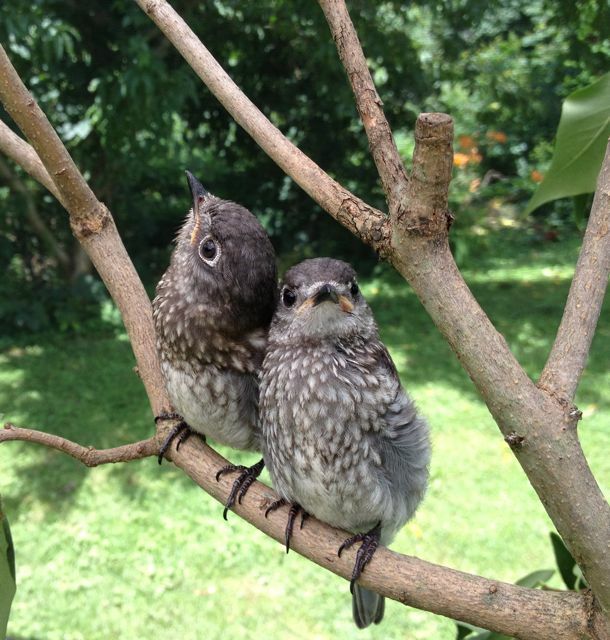 If I've been a bit scarce lately, it's because they've worn me ragged, teaching courses and cooking for the little Bluebird Survival School being held right in my yard. I hope by Wednesday morning they will no longer need me to pop out of the house like a figure on a cuckoo clock, every hour on the hour, to feed them. Toddy (left, with dark red breast) and Ida, hanging out in the yard. Ida caught a moth on the side of the chimney this morning and gobbled it down. You go girl! On Friday, August 2, I'll present the same talk to Chautauqua's Bird Tree and Garden Club for their Life Member Centennial Luncheon. Which is not free or open to the public, but is a huge honor for me to address. Holy cow. A gardening club in its centennial. An august organization. Which, perhaps is why the luncheon is in August. I adore going to Chautauqua. It's a little island of bustling serenity, culture, music, art, and deep thought. And it has fabulous flowers and the most alluring porches. So if you're in the Jamestown NY area, come and see me at the Roger Tory Peterson Institute next Wednesday. Or maybe I'll run into you on the shaded walks of Chautauqua. If I'm not running, I'll be festooned with cameras. Taking my best pal Shila for much needed R & R and photoexpotition. Squee! Bluebirds, get yo act together. Mama's going on a road trip. Oh, I wish I was still visiting my sister in NY! Jamestown is a 4 hour drive for me, but I am so tempted and my husband just said "go for it"! You and Chet Baker are my blog heroes and I love your books. So, this Mama might be going on a road trip, too!